Book yourself a 90-minute journey into bliss with a Thai Yoga Massage. I was trained at Lotus Palm Montreal and truly love to give and receive this message. During this experience, I diffuse a grounding and relaxing blend of doTERRA essential oils and apply them to the feet as well. These are the most incredible essential oils I have used and they will enhance the benefits of the Thai yoga massage. 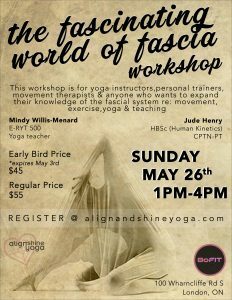 This workshop is for yoga instructors, personal trainers, movement therapists and anyone who wants to expand their knowledge of the amazing fascial system re: movement, exercise, yoga and teaching too. Will you require a Yoga Alliance continuing education credit?